The Phablet market share has shown a magnificent growth the last year in India. This suggests to us that the Indian buyers have started believing in extra large Touch Screen Smartphones. Phablets or Smartphones with big display screens have attracted the Indian buyers with their complete multimedia & entertainment features. There are many other factors which have contributed to this growth including the various EMI schemes and affordable price tags. There are many key players of the Phablet segment in India. The South Korean manufacturer Samsung is leading here also. However, Samsung is facing a tough competition from the Indian manufacturers Micromax and Karbonn. The Indian Phablets have tasted a great bit of success in the year 2013. Looking for a new road of success, the Finnish brand Nokia has launched their latest offering Nokia Lumia 1320, which is the cheapest Windows Phone with 6-inch touch screen display in the Indian market. Nokia Lumia 1320 is a complete multimedia package for those who want to work and play together on the go. This Smartphone is launched with a competitive price tag of Rs. 23,999. Here, we bring a brief introduction of the latest Nokia Lumia 1320. Nokia Lumia 1320 measures 164.2 x 85.9 x 9.8mm and weighs only 220g. It sports a 6-inch ClearBlack IPS LCD Touch Screen, which is capable of producing a resolution of 1280 x 720 pixels at 244 pixels per inch. It is protected by Corning Gorilla Glass 2. Watching HD videos & playing games would be a treat to your eyes on this device. The user of Nokia Lumia 1320 won’t be disappointed with the performance of the display and touch screen. Nokia Lumia 1320 is powered by a 1.7GHz Qualcomm Snapdragon S4 chipset, Dual Core processor supported with 1GB of RAM. It runs on latest Microsoft’s Windows Phone 8 operating system. One can easily download many useful applications and addictive games from the official Windows Phone Store. This hardware configuration can easily meet many big applications and HD games on this Smartphone with an ease. Nokia Lumia 1320 houses a 5 Megapixels autofocus rear camera with single LED flash and 1/4 inch sensor size. It also packs a poor VGA camera on its front for video calls. There is nothing interesting about the rear camera to discuss. However, few exclusive Nokia applications add up the camera features on this device. Nokia Lumia 1320 packs 8GB of internal storage memory which can be expanded up to 64GB using a MicroSD card. For connectivity, Nokia Lumia 1320 supports 3G, Bluetooth 4.0, GPS with A-GPS, WI-Fi, WI-Fi hotspot (Internet Sharing), USB 2.0, MicroUSB and other standard options like 3.5mm audio jack. It misses NFC connectivity for payments, sharing and tagging. Nokia Lumia 1320 is fuelled by a strong 3400mAH non removable battery. It also features wireless charging option. Nokia Lumia 1320 is a complete Smartphone package which hosts tons of useful and entertaining features on it. One could be disappointed with its standard camera capabilities at its price tag. However, its brilliant 6-inch display and hardware configuration makes it a worth buy multimedia package. 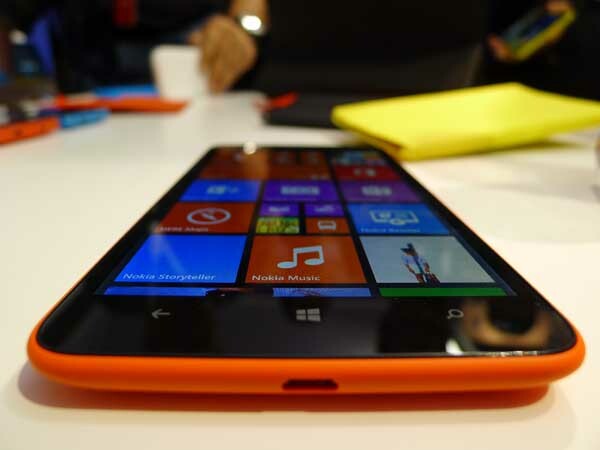 Nokia Lumia 1320 targets young buyers who are looking for a complete entertaining Smartphone. If you are planning to buy your next phablet, Nokia Lumia 1320 is worth a pick. Subscribe Here to get Latest Technology updates within your inbox.